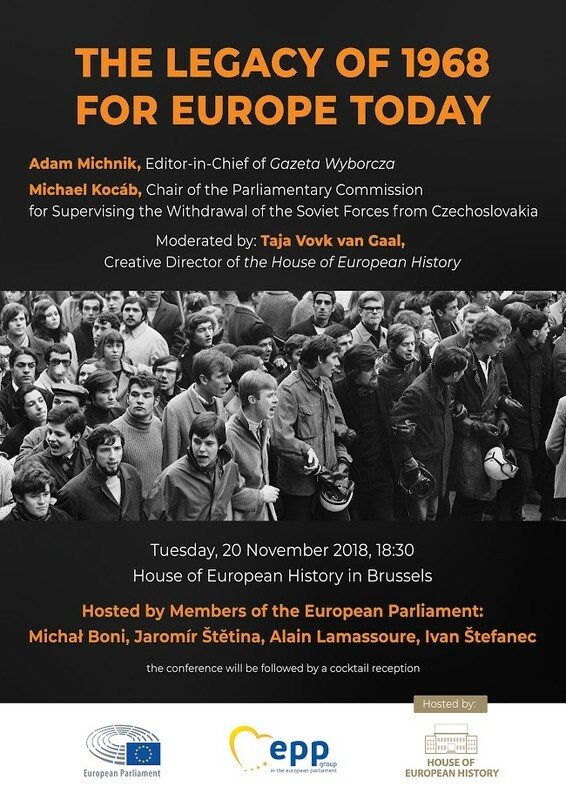 The discussion, with honorary participation of Adam Michnik - Editor-in-Chief of Gazeta Wyborcza - and Michael Kocáb - Chair of the Parliamentary Commission for Supervising the Withdrawal of the Soviet Forces from Czechoslovakia - will give voice to witnesses and participants of the 1968 protests in Poland, former Czechoslovakia and France. It will analyse the events within their country specific context as well as taking into account a wider European perspective, and most importantly, their meaning for us and our continent today. Discussion in original languages, with English interpretation. Event co-organised by Members of the European Parliament: Michał Boni (Poland), Alain Lamassoure (France), Jaromír Štětina (Czech Republic) and Ivan Štefanec (Slovakia).